One of the questions we get asked most often here at ClassMax is how to use it in a classroom. I see teachers who set their accounts up but then aren’t sure where to go from there. They want to use ClassMax as a tool for data collection instead of what it really is at its core: a tool for changing the way we teach. In a ClassMax classroom, teachers are not merely collecting data. The data is simply the byproduct of this new type of teaching. In a ClassMax classroom, teachers are spending more of their time observing, facilitating, encouraging, and supporting learning and less time testing, assessing, talking, and doing. And isn’t that really what our students need? They need less of adults doing for them and more of the responsibility and ownership of their learning placed on them. A student-centered classroom is less about putting the student in the center and more about not putting the teacher in the center. So, where then is the place of the teacher, if not in front of our students? It is among our students. In a 21st century classroom, teachers should be among their students. If you mentally divide the classroom into three parts, traditional instruction (and habit for most of us) dictates that the teacher spend most of their time in the front third of the classroom. Our role is to instruct and to instruct means to be seen and to be seen means we stand in front of our students. It’s where the action is – our whiteboard is up there, our projector is up there, our common board is up there, usually our desk is up there. Up front is where the action is in a classroom. Which is also why the back of the classroom is where the action is for our students… amiright? When you have ClassMax open on your device as you stand in the front of the classroom, it might be difficult to figure out what to do next. Because here is the thing: All this data we are talking about collecting can’t be done from the front of the classroom, teacher friends. And try as we might, if we are continuing to teach as we normally do with this powerful tool in our hands, it isn’t going to do much for you. Sure, it might help track your hall passes, but there is so much more it can and should do! But for it to be the most effective, you might have to change your teaching style just a bit, because an tool is only as effective as the teacher who wields it. 1. ClassMax teachers are listeners. I’m starting with this one because it is the both the hardest for me to accomplish and the biggest change I have noticed in myself since I have been using ClassMax in my classroom. With so much of my data coming from me and not from assessments, I HAD to become a better listener in my classroom and from this, I have found that so much of learning comes not from my lessons or activities, but from the conversations and interactions happening among my students. They ask each other questions and from those questions I can tell what they know and what they don’t – and I record that finding in ClassMax. They correct each other’s learning and from those clarifications I can see how much they are progressing or if they are stuck on something – and I record that finding in ClassMax. They discuss how to word answers they are going to write down and I can understand where their gaps in understanding are based on what their answers include or don’t include – and I record that finding in ClassMax. When I am actively listening to students working around me, I get much more of a complete picture of their learning than I do when they fill in a bubble sheet. And so when I mark their progress in ClassMax based on those things I have heard in the classroom, that data is much more dependable and concentrated than that bubble sheet would have been. 2. ClassMax teachers are observers. Listening is not the only skill that I improved on since I started using ClassMax. My overall visual observations are becoming much more astute than they have been before. When I am out among my students, moving through them to assess their learning in ClassMax, I am looking for a few specific things. I’m looking for those faces of students who I just know are s-t-u-c-k. You know those faces. They are scrunched up or scowled down and anything but happy. I’m looking for those students who are off-task and talking because most of the time, if they aren’t on task, it’s because the work is either above or below them. I’m looking for groups of students who have their heads together, pouring over part of the activity for an extended period of time because if it takes that many kids to figure something out, I need to reteach. The specifics of their learning aren’t even known yet from these observations, but from just watching them intently, I can begin to identify who needs more and who needs less. And when I see these things, I mark them in ClassMax. I turn those observations into something real – a number or a percentage or a note, something that can drive my instruction for each child individually. 3. ClassMax teachers are attentive. One of the things teachers like most about the ClassMax dashboard is the ability to color-code students using the apple icons. Personally, it’s one of my favorite features. But color-coded apples aren’t just for looks. They are designed to prompt action in a teacher. I use the apples in the first 10 minutes of an activity and in the last 10 minutes of an activity. While students are working, I go through each red apple (which indicates an ESE student for me) and I make sure I go over and talk to that student. Every day. Every activity. Every red apple. And before I walk over to them, I check their accommodations on their ClassMax profile so that I am sure I have used all the applicable accommodations in that lesson for them. Walking around the classroom randomly monitoring students is how we usually facilitate learning in a classroom, right? But we can use ClassMax to make those classroom rounds much more attentive and intentional, maximizing what we give our students and, in turn, what they learn. After I have visited a “red apple” student, I make a log of which accommodations I used with them while I was there and then make some notes in ClassMax about what I heard or observed while I was with them. THAT is attentive instruction, friends. It’s making sure we aren’t giving the majority of our time to the discipline kids or the loud kids or the disruptive kids, but to the students who really need us the most. 4. ClassMax teachers are communicative. When you are collecting quality information in your classroom and when reporting is as easy as ClassMax makes it, why NOT be communicative?! Information does not serve your students if it sits inside a computer program, so get it out of there! Reporting is simple in ClassMax not because the data itself is simple, but because we believe student data should be easily accessible and understandable in order to be effective. So, use those reports to communicate to students by having data chats with them about what you are seeing, hearing, and paying attention to in class (here is a great blog post on how to have data chats using ClassMax). Send reports home for parent signatures. Send reports for students you are concerned about to guidance, to the deans, to staffing specialists, to your admin teams. If you don’t use the data, then it’s just a bunch of numbers on a page. 5. ClassMax teachers are proactive. If you are using ClassMax effectively in your classroom, meaning you are out among your students listening, observing, being attentive, and communicating, it will become much easier for you to notice trends in student learning. And when you can recognize trends, then you can proactively begin guiding students through the obstacle course of learning – steering them away from misconceptions, leading them around misunderstandings, and building bridges over their gaps in knowledge. It’s hard to be a proactive teacher from a bubble sheet. It’s hard to plan and execute effective lessons for ALL your students when you don’t know the progress of ALL your students intimately. With ClassMax, as you chronicle their learning through data collection, you are simultaneously building pathways for their learning that are based not on generalized questions and answers in an assignment or assessment, but based on something substantial, like intentional listening and observing of your students. Reactive teachers assess learning and move forward. Proactive teachers understand learning and move forward. Can ClassMax be a tool that simply supports what you are already doing in your classroom? Sure. Can ClassMax be a tool that makes your current teaching practices simpler? You bet. But can ClassMax also be the guide to help you become a better teacher? ABSOLUTELY. 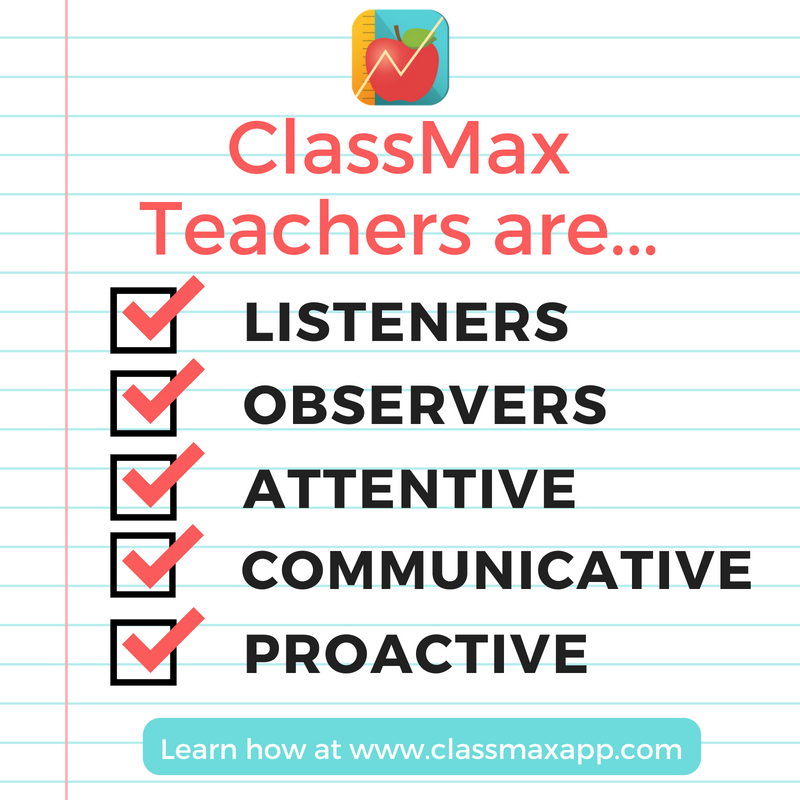 Through listening, observing, and being attentive, communicative, and proactive, ClassMax can not only maximize your classroom success, but can maximize your teaching practices. It can help focus you on individual students and then turn those meaningful interactions into quantifiable data. As educators, if we truly believe that students are more than a test score, it’s time we started teaching them that way. This entry was posted in Innovative Uses, Teacher Life and tagged ClassMax, teacher life.